Michelle Angeles, Materials Manager for the Hilton Resort and Spa, visited GSAT on March 8 seeking information related to facilitating accessibility at the Hilton. After considering several options, she borrowed a Braille Labeler in preparation for an inspection to help ensure their facilities are accessible to individuals who are blind. The device was returned on March 17 after the facility successfully passed an inspection. The Hilton is now planing to purchase their own Braille Labeler. 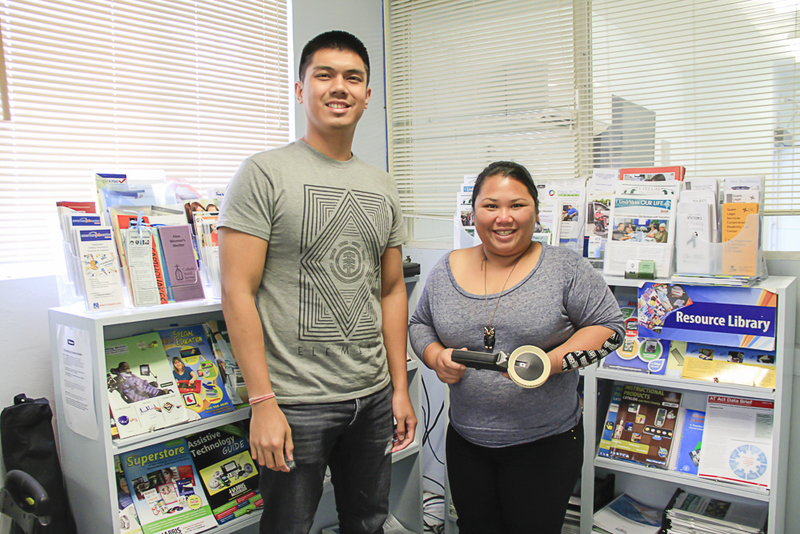 Shown (L-R) are John Guiao, GSAT Student Office Assistant and Ms. Angeles. 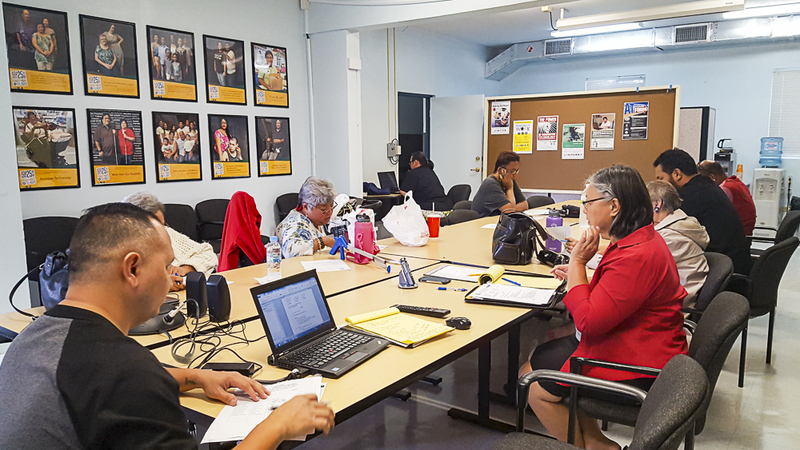 The GSAT Conference and Fair Planning Committee met on February 16. In attendance were, (right, counterclockwise) Mary Kidd, GSAT Consultant; Dawn Maka, Member at Large; Evangelis Babauta, ASL Interpreter; Jeffery Warfield, DISID Representative; Raymond Sayas, GDDC Representative; Evelyn Duenas, Member; Josephine Cortez, Member at Large, and Jack Larimer, GDOE Representative. Also in attendance were Leah Abelon, GSAT Center Coordinator and Barbara Johnson, Vice Chairperson. (not in the photo). 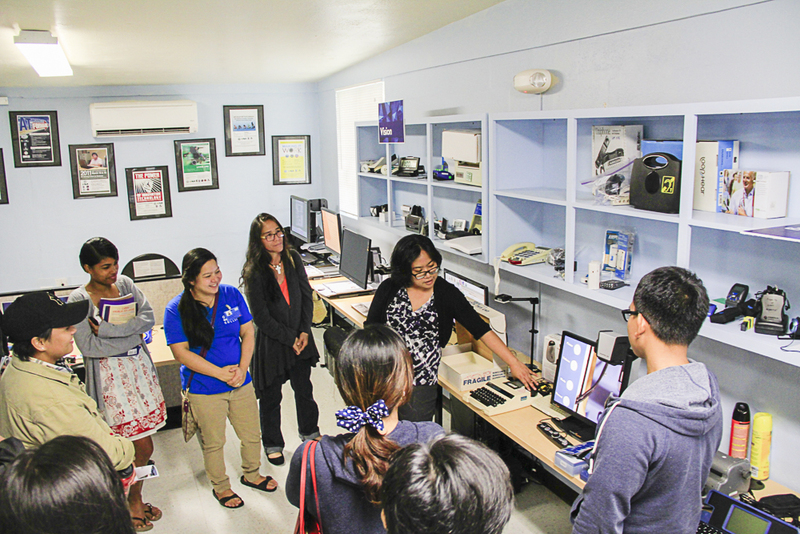 Guam System For Assistive Technology (GSAT) AT Coordinator, Leah Abelon, demonstrated the use of various AT devices on January 18-19, 2017 for students enrolled in Guam Community College’s American Sign Language classes. Eighty-two students attended the demonstrations which took place in AT Model Home located at House 20 Deans Circle, on the University of Guam campus.